There is no argument now, Christmas is really coming. A week tomorrow to be exact. 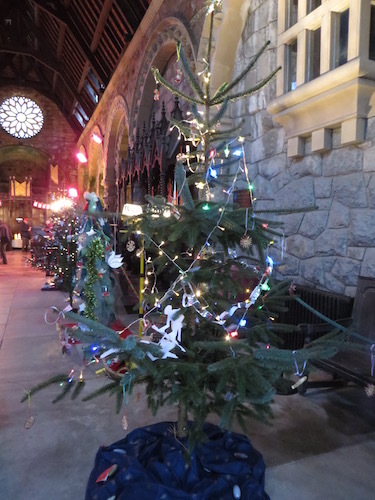 I first started getting into the mood when we visited one of our nearby churches, St Conan’s, Lochawe – where there was a display of Christmas trees. Each tree was designed by a local organisation, hence the stunning variety of shapes, sizes, colours, materials and design. What you cannot see from the photos is the temperature inside the church – cold right through to your bones; no wonder they are in the middle of a fund-raising campaign. The roof is leaking and thieves have stolen lead from the cloisters at least three times. Anyway, I digress, so back to the plot as it were. The snow silently fell all night until there was at least a foot of pristine, sparkling softness . . . . . . . . . too magical to resist. I went for a walk with the dog, (a retriever with very long legs,) she had her long shaggy coat and I was wrapped up in waterproofs. Down I flopped onto the puffy snow and made the regulation flapping of arms and legs. I couldn’t jump up, so the final effect wasn’t quite perfect, but it was good enough. And Oh how much better I felt. Christmas is a time for remembering, for allowing ourselves to enter the mystical and to take time to breathe and to heal in the depths of winter. Right now in Argyll there is no snow. The temperature is around 11 or 12C during the day and not much colder at night. Primulas are blooming and crocuses have started to peek through the ground, but it is still time to unpack our Christmas memories and decorations and send good wishes to friends and family here and passed on. This year, all being well, I will be leading a service at our local church. The first time in a while that I have taken Christmas Day worship. I’m looking forward to it and grateful for the way it has helped me to focus on the reasons we celebrate at this time of year. It truly is a time of hope, and in the face of all the darkness around, we really need it. For all the people who are fleeing violence and for all those welcoming them I pray for peace. Christmas Blessings to you and yours from Dalamory. 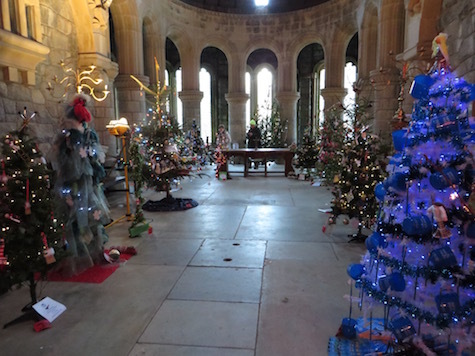 This entry was posted in Blog and tagged Christmas, Christmas Trees, church, Prayer, Snow Angels, spirituality. Bookmark the permalink. Blessings to you and I so wish your service was being televised. I hope your renewing acquaintance with the Christmas Day service is a truly happy event. The pictures on this blog are really interesting. St Conan’s looks to be a really lovely old building (the trees are just a bonus). Have a wonderful peaceful and blessed Christmas (all of you that is). Oh, it makes me so angry that fundraising has to be undertaken to replace stolen roofs. As if there weren’t enough good causes that need our attention! I wish the thieves would fall off the roofs! Okay, that’s not very Christian, but . . . I hope your own Christmas service will not be a time for asking for donations but a celebration of the true meaning of the day, a time of joy and goodwill to all mankind. A lovely christmas message and thank you for sharing it. Merry Christmas to you and yours.